Switch between the Transform and Select tools directly from the Transform tool or Select tool Tool Properties views. 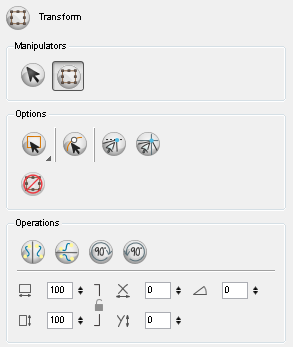 Choose between the Lasso and the Marquee modes to change the selection style of the Transform tool. • Click and hold [Alt] to temporarily switch from the current selected mode to the other. • From the top menu, select Edit > Invert Selection, or press [Ctrl] + [Shift] + [I] (Windows/Linux) or [⌘] + [Shift] + [I] (Mac OS X). You may also find the Invert Selection option from the Camera View or Drawing View menu by selecting Edit > Invert Selection. Click the Peg Selection Mode button to limit the selection in the Camera view to pegs. When disabled, the Transform tool selects the drawing layers. This mode can be useful when you have created your character rig using peg layers for each drawing. That way, you don't accidentally select the drawing layer, when you want to animate on the peg. When transforming or repositioning your layer using the Transform tool, you can enable different snap options to help you. • Snap and Align: Snaps the selected layer to any existing line, while automatically displaying temporary rulers that guide you and that you can also snap your object to. • Snap to Grid: Snaps your selection according to the currently enabled grid. Enable the Hide Manipulator Controls option to hide the bounding box and manipulator controls from the Camera view when an element is selected. Use these buttons to flip the selected element horizontally or vertically. • You can also select Animation > Flip > Flip Horizontal and Flip Vertical or press  or . Use the Width and Height fields to enter specific values when you want to accurately resize the selected layer. 1. Width: type a width value in this field to resize the width of your selection. 2. Height: type a height value in this field to resize the height of your selection. 3. Use the up and down arrows to modify the value contained in either the Width or Height value field. 4. Lock icon: Click on the lock icon to either lock or unlock the ratio between the width and height values. Use the Offset X and Offset Y fields to enter specific values to reposition the selected layer accurately. 1. X: type an offset value in this field to reposition the selected layer along the X-axis. 2. Y: type an offset value in this field to reposition the selected layer along the Y-axis. 3. Use the up and down arrows to modify the value contained in either the X or Y value field. Use the Angle field to enter specific values to rotate the selected layer accurately. A positive value will rotate the layer counter-clockwise and a negative value will rotate the layer clockwise. 1. Angle: type a degree value in this field to rotate the selected layer. 2. Use the up and down arrows to modify the value contained in the Angle value field.